Nutanix Just released AOS 5.5 “Code Name - Obelix”, along with AHV 5.5, Prism Central 5.5, AFS 2.2.0, LCM 1.3, and Foundation 3.11.2. 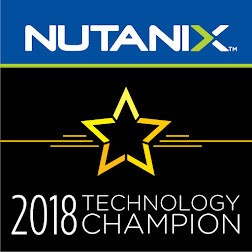 Nutanix Calm allows you to seamlessly select, provision, and manage your business applications across your infrastructure for both the private and public clouds. Nutanix Calm provides App lifecycle, monitoring and remediation to manage your heterogeneous infrastructure, for example, VMs or bare-metal servers. Nutanix Calm supports multiple platforms so that you can use the single self-service and automation interface to manage all your infrastructure. Nutanix Calm provides an interactive and user friendly Graphical User Interface (GUI) to manage your infrastructure. You can access the Nutanix Calm feature from the Prism Central. Application Lifecycle Management: Automates the provision and deletion of both traditional multi-tiered applications and modern distributed services by using pre-integrated blueprints that make management of applications simple in both private (AHV) and public cloud (AWS). Customizable Blueprints: Simplifies the setup and management of custom enterprise applications by incorporating the elements of each app, including relevant VMs, configurations and related binaries into an easy-to-use blueprint that can be managed by the infrastructure team. Nutanix Marketplace: Publishes the application blueprints directly to the end users through Marketplace. Governance: Maintains control with role-based governance thereby limiting the user operations that are based on the permissions. Hybrid Cloud Management: Automates the provisioning of a hybrid cloud architecture, scaling both multi-tiered and distributed applications across cloud environments, including AWS. Prism Central now includes machine-learning capabilities that analyze resource usage over time and provide tools to monitor resource consumption, identify abnormal behavior, and guide resource planning. · Anomaly detection to record when performance or resource usage is outside an expected range based on learned VM baseline behavior. · "Smart" alerts that trigger when specified anomalies are recorded. · Reports that summarize cluster efficiency. The Prism Self Service feature allows you to create projects where consumers of IT infrastructure within an enterprise—individual users or teams such as development, test, and DevOps—can provision and manage VMs in a self-service manner, without having to engage IT in day-to-day operations. Now you can manage the full range of self-service portal features from the Prism Central web console user interface. The report management feature provides you with an ability to configure and deliver the historical reports containing information about the infrastructure resources. This feature provides the operational insights of your infrastructure into your mailbox according to the schedule that you have configured. Style: Defines the way to represent the report, for example background color, logos, and so on. Representation of data: Defines the way that you want to represent the data. You can accomplish this by including different views (pre-defined and customizable). Data: Defines the actual data depending on your selection, for example information about different metrics; CPU usage, memory usage, IOPS bandwidth, VM count, host count, cluster count, license summary etc. AOS 5.5 now supports Windows Server 2016 and Hyper-V 2016.This release now supports virtual hard disks (.vhdx) that are 2 TB or greater in size in Hyper-V clusters. Network segmentation in an AHV cluster is a security feature that separates management traffic from backplane traffic by creating separate virtual networks, one for each of these traffic types, on the default external virtual switch on each host. To enable the CVMs in a cluster to communicate over these networks, the CVMs are multihomed by the addition of a third virtual network interface card (vNIC) to the Controller VM. Additionally, the hypervisor is assigned an interface on the backplane network. Support for single node clusters running user VMs. Single Node clusters are fully supported with NX-1175S-G5. Limited user VM use is supported on NX-1155-G5 depending on the compute available and which only supports AHV. The NearSync feature provides you with the ability to protect your data with up to 1 minute RPO. NearSync secure your data with minimal data loss in case of a disaster and provides you with more granular control during the restore process. The NearSync feature allows resolution to a disaster event in minutes. AHV Turbo replaces the QEMU SCSI data path in the AHV architecture for improved storage performance. vNUMA optimizes memory performance of virtual machines that require more vCPUs or memory than the capacity of a single physical NUMA node. In a vNUMA topology, you can create multiple vNUMA nodes where each vNUMA node includes vCPUs and virtual RAM. When you assign a vNUMA node to a physical NUMA node, the vCPUs can intelligently determine the memory latency (high or low). Low memory latency within a vNUMA node results in low latency within a physical NUMA node. AHV hosts support Virtual Non-uniform Memory Access (vNUMA) on virtual machines. You can enable vNUMA on VMs when you create or modify the VMs to optimize memory performance. AOS 5.5 Controller VMs and Prism Central VMs are now running the CentOS-7.3 kernel with Python 2.7. Nutanix now supports the OpenLDAP directory service running on CentOS distributions. Acropolis Image create, update, delete (CUD) behavior has changed in this release. Image API CUD behavior depends on whether a cluster (also known as Prism Element) is registered to Prism Central. If the Prism Element (PE) cluster is newly created and has never been registered with a Prism Central instance (that is, never managed by Prism Central), all image CUD operations will be allowed on the PE cluster. If the PE cluster is registered with a Prism Central instance (that is, managed by Prism Central) CUD operations will be blocked on the PE cluster. Ownership of images is migrated from PE to Prism Central. CUD operations must be performed through Prism Central. If the PE cluster is unregistered from Prism Central, new images can be created, updated and deleted on the PE clusters. Update operations are blocked on the PE cluster for images that previously migrated to Prism Central. In the case of a local image local file upload, with more than one PE cluster managed by Prism Central, the image state is active on that PE cluster. All other PE clusters will show the image as inactive. If you create a VM from that image, the image bits are copied to the other PE clusters. The image then appears in an active state on all managed PE clusters. The Connect to Citrix Cloud feature leverages the automated installer functionality of the Citrix Cloud connector to establish a secure communication channel between Nutanix and Citrix Cloud. This feature provides single-click integration of the on-premise Nutanix clusters (as a resource location) with the Citrix Cloud environment.